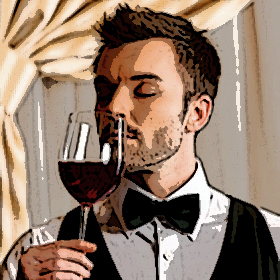 For a period of about ten years I lived, breathed, and thought about wine nearly every day. I subscribed to weekly food and wine newsletters from major California and Oregon newspapers, read books on wine making, and used words such as terroir and varietal. I’m sure I said those words when I visited wine stores, or at a dinner table with friends and family. I would also post about wines on my Facebook page, giving an impression to all that I was a real connoisseur. But I was hardly a connoisseur. It takes years to really understand wines, and it also helps to travel to far-away, exotic places to taste and learn. My schooling was nearly all in California, within two hours of a central coast wine region that specialized in one major grape — the hearty Zinfandel.¹ I had taken a grand total of ONE trip to Napa and Sonoma. Still, my knowledge about wine was at least somewhere between novice and intermediate. Shortly after I separated from my first wife, wine purchases suddenly took a dramatic downward quality. As quickly as you can say the words alimony negotiations, I literally went from a Bordeaux Petite Verdot to a San Joaquin Valley “Two Buck Chuck.” I was buying wines that would make me wince with each swallow, but they were all I could afford. This lasted for two years. Finally, one glorious late December day my accountant called with wonderful news. I was allowed to change the tax withholdings in my paycheck to a less draconian amount. With the very next paycheck in January, I recall buying a Clos du Val Cabernet on my way home from work and opening it in my apartment. Along with a plate of crackers and cheese, I savored that bottle all night sitting in my darkened living room. Although that might sound rather depressing, it was actually cathartic. I had made it through a personal milestone — sacrifices were made, quality was certainly cut in all areas, but I had survived quite fine. That Cabernet was heavenly. My palate had forgiven me. However, something had changed. Although I didn’t lose any love for wine, my passion for it had ebbed. The food and wine newsletters were no longer interesting; nor were the fancy tasting events at wine shops that I had learned to ignore for the previous two years. I thankfully still had a good foundation of knowledge about wine, but my insatiable interest for it had indeed passed. If Whole Foods had a big display featuring a Williamette or Loire Valley vintage, I would just go ahead and buy it rather than study the bottle and signage. I was just thankful for what I hoped was good advice. No longer was it important to me if a vineyard was downwind from a farm that grew tobacco, or that one could taste hints of coffee beans should the wine be aerated at a seven and a half degree angle. I just wanted wine that tasted good. This past week my oldest sister visited us. We ate several meals in fine restaurants, and we dutifully studied the wine selections each time to make sure we chose just the right one. Because I am and always will be her younger brother who doesn’t know as much, my sister expressed strong opinions on the offerings that I knew to be contrary to my own knowledge. In my earlier days I would have delighted in explaining exactly why she was wrong, pointing out in specific detail why a gamey, fatty entree such as duck pairs well with an equally racy and gamey Pinot Noir or Spanish Rioja. Now, however, I was quite content to be silent. I watched her instead select what I knew was an unsuitably paired Barbera. And yet we did just fine — the world didn’t end. Anthony Bourdain, Robert Parker, and Laurie Daniel all didn’t come storming out of the kitchen to stand at our table and raise eyebrows at our faux pas. In fact, I would go so far as to say the Barbera was excellent. My sister continues to think she’s a wine expert, and that’s as it should be. Let the mystery be. Tonight Gorgeous and I had a Napa Syrah that had absolutely no notes of pepper as most good Syrah/Shiraz normally do. But I could care less because it tasted just great with her stuffed cabbage. Let the experts opine on what is correct; I just want it to taste good. ¹ This is the Paso Robles wine district of California. I personally find Zinfandel to be too sweet, but Paso Robles is a wonderful wine region to visit and learn about wine from friendly, down-to-earth pourers. Highly recommended! I’m with you Zin is too sweet but many of my girlfriends like sweeter wines. When they open a bottle of sweet stuff, I get beer! (or maybe a margarita!) Good to have you writing again! I agree, Kate. The most I can handle is a Riesling, which I do find refreshing in the summer. I’m just worried again about writer’s block!